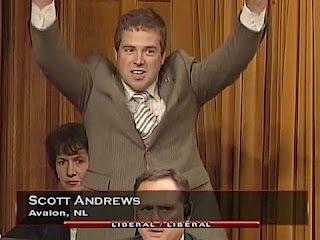 Rookie MP Scott Andrews is showing that he knows how to stick handle his way around the House of Commons. At a time when Parliamentary co-operation is in short supply, the 36 year old's Bagby Bill recieved unanimous support on it's third reading in the House of Commons yesterday. The Liberal MP for Avalon introduced the bill in October and he successfully shepherded it through three readings and received the unanimous support of the House of Commons Justice Committee. The bill, officially known as C-464, moves to the Senate where it is expected to get unanimous support. How big an achievement is this? Since 2001, only 21 of the 2,400 private member bills introduced in the House of Commons have gotten royal assent. In 2003, physician Shirley Turner,drowned herself and her 13 month old son, while she was on bail waiting on an extradition decision to face a murder charge for the shooting death of her former boyfriend, the child's father - Andrew Bagby. Bill C-464 when enacted will amend the Criminal Code to provide that the detention of an accused in custody may be justified where it is necessary for the protection or safety of the accused’s minor children.